This post is different to what usually gets written here. It was written by a dear family friend of mine for whom I have the utmost respect. This post takes on a very complex issue in a way that may be considered confronting by some. In light of the events in Christchurch, I think it’s time to be honest and open about the state of this country and where we are going. If you are unable to take on strong views on multiculturalism, this post is not for you. My name is Marco Idris, and I’m a Muslim of mixed origins. I’m a resident of Oman, and have lived in Australia, Singapore and Indonesia. Personally, my family and I prefer a traditional, conservative expression of Islam, the type that can be found in rural Oman and Yemen. But I always endeavour to be objective in understanding different cultures and creeds. My thoughts on the Act of Terror by Brenton Tarrant. I’m a Muslim, and I’ll speak freely as such. For those killed at the mosque in Christchurch: It was the end of their of time – all as God wills. To die while performing the Friday Prayer is a great honour for a Muslim and we pray their souls are rewarded as martyrs. As for the killer, it is the duty of New Zealand authorities to bring him to justice by their laws. But he will not escape the Judgement of God on the Last Day – nor will anyone else. The killer is a White Supremacist and he is not alone in his ideology. I’ve read his manifesto, “The Great Replacement”, and have come to the following diagnosis of the situation. I believe the problem lies in a National Identity Crisis in the Anglosphere, in the United Kingdom, the United States, Canada, Australia and New Zealand. Most nations in the world have a dominant culture. China, India, Brazil, Zambia, Russia, Italy, Morocco, Syria, Yemen, the list goes on. Sometimes religion is part of culture. Either way, there is a dominant cultural identity – one that is accepted as status quo. The Chinese won’t accept Shanghai turning Hispanic, the Indians won’t accept Mumbai turning Arab, and so on. We Muslims won’t accept it too if Yemen turns into America or Syria turns into Russia. All this is pretty much status quo, often enshrined in the constitution of the country. The Arab nations of the Gulf have laws that ensure the Islamic and Arab landscape, even as migrants outnumber locals. The Anglophonic nations of the West (UK, US, Canada, Australia, NZ), however, are unique. The civilisations that built those countries were largely Anglo-Saxon and Christian in culture and religion. The native people of those lands point out that they were there first – an undisputed fact – but the reality, for better or for worse, is that neither the Amerindians nor Australian Aborigines nor Maoris shaped the primary constitution and culture of those countries. English is the main official language; the Westminster model is official in Parliament; and the elite schools are Anglo-Christian in their foundations. So like it or not, the aforementioned nations have to be regarded as predominantly Anglo-Saxon Christian based societies. But they also take pride in being democratic, egalitarian, and open to all races and creeds. Multiculturalism is thus inevitable. But are we ready for Multiculturalism? 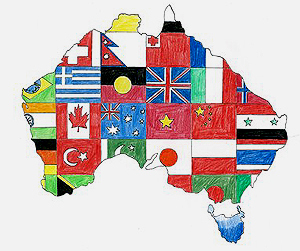 Many Aussies (those of Anglo-Saxon Christian background) tell me they like multiculturalism; they think it’s cool that their kids have Asian, Arab and African friends at school. Would they be happy though, if after 20 years Perth resembles China, Melbourne resembles India, and Sydney resembles Syria? I asked this question several times and got puzzled looks. Most of them said: “errr not really”. The reality is, with Multiculturalism in place you cannot prevent Perth becoming like China, nor Melbourne becoming like India, nor Sydney becoming like Syria. Everyone has the right to express – and even spread – their culture and religion. Lakemba is already resembling Lebanon and already there are issues. At the end of the day most societies wish to maintain their culture and religion. In other words, most countries are opposed to hard multiculturalism. The UK, US, Canada, Australia and NZ are no different. But in these countries Multiculturalism is a political doctrine, and many take pride in it. This is the bone of contention. If we look at the national constitutions of the UK, US, Canada, Australia and NZ, we find no discrimination with regards to religion and culture. Technically a Muslim or Hindu can become the Head of State. Technically there is no discrimination with regards to race too. Barack Obama was elected POTUS but his African-Muslim family heritage became an issue. One wonders, how would people react if a practicing Muslim became PM of Australia and took his oath upon the Qur’an? Or for that matter, if a turbaned Sikh became PM? Constitutionally it is entirely possible. So you cannot have your cake and eat it too. If your country has Multiculturalism as a political doctrine – if constitutionally all religions and cultures are equal – then it is entirely possible for your country to lose its primary cultural and religious landscape. It is entirely possible for your country to be culturally “Invaded”, and have its culture “Replaced”, to use the words of Brenton Tarrant. The killer of 50 Muslim worshippers resorted to terrorism (the killing of civilians), and as a result was widely condemned. His manifesto however is not that of a lone wolf, and, judging from comments on social media, he gained sympathy from the Alt-Right. Senator Fraser Anning condemned his act of terror but echoed parts of the manifesto in the Australian Parliament. These Australian individuals made it crystal clear: Australia should be an Anglo-Saxon Christian country. Islam is not welcome. Yet other Aussies will say the exact opposite, and Muslims in Australia (along with those in the US, UK, Canada and NZ) feel at liberty to express – and even spread – their religion and culture. This is due to the national constitutions of these countries, and the perception of them as open, multicultural societies, where all races and creeds are equal. But do the majority of Aussies really accept the presence of Islam in the country? We have to be consistent. Most Muslim countries welcome non-Muslim residents, but under certain conditions. For example non-Muslims can’t become the Head of State, can’t openly criticise Islam, and can’t openly convert Muslims to their faith. Ramadan norms must also be respected. These regulations ensure Islam’s status as the dominant religion, which many of us Muslims feel are justified in a country that is constitutionally Islamic. The non-Muslims who choose to live there (and there are a good number who live happily there) do so knowing that the society will be predominantly Muslim. The boundaries are clearly drawn. Thus it would be helpful to us all, if Australia (along with the US, UK, Canada and NZ) defines itself clearly as a nation, and defines its dominant culture and/or religion. In my view, Australia has to choose: Uphold Multiculturalism and accept the presence of Islam wholeheartedly (and not complain if the landscape becomes increasingly Islamic) or reject Multiculturalism and state up front that Islam is not really welcome. 1. Australia is a Multicultural nation… Islam is completely welcome, and all expressions of Islam (including the Burqa, the Call to Prayer, etc) are accepted in Australian society. 2. Australia is open to different cultures and religions, but remains an Anglo-Saxon Christian nation… Islam is welcome, but under certain conditions. Muslims who choose to live here cannot wear the Burqa, cannot conduct the Call to Prayer publicly, etc. 3. Australia is an Anglo-Saxon Christian nation… The values of Islam are in contradiction to its values, and Islam is therefore not welcome. Muslims who choose to live in Australia must keep their faith private and not display it publicly. Following a declaration of one of the above, Muslims (and others) can make a decision on whether they wish to call Australia home and the position of Muslims in Australia will be clear. There will be no room for assumptions and suspicions.